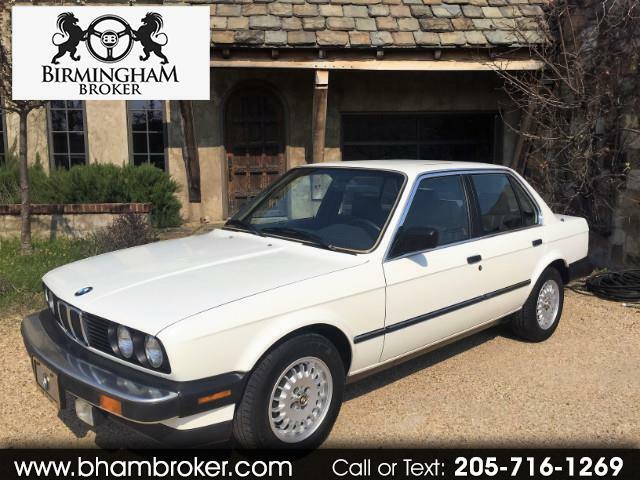 ALL ORIGINAL, LOW MILES, AUTOMATIC, LEATHER, ALL TOOLS – Alpine White over dark blue leather, equipped with a 2.5L six-cylinder linked to a four-speed automatic. This all-original 325i is a time capsule! Leather seats, air conditioning, cassette player, cruise control, rear window defroster, fog lights, all tools, sunroof, power windows and more! Errors and Omissions Disclaimer: Our dealership is not responsible for voided factory warranties. Dealer is not responsible for any option listed in the ad. Please verify the options at the time of purchase. Ads are placed by decoding VIN numbers and some options may get automatically selected. No intention of misleading the customer. All Inventory listed is subject to prior sale. Brokered vehicles may in some rare cases – be short-term unavailable. Each transaction will include a $479.00 Document Fee plus any applicable in-state tax and title fee. We do trade-Ins, provide financing, and offer extended vehicle warranties on most vehicles. Ask dealer for details. Call us at (205) 716-1269 today to schedule a demonstration drive. Thank you for shopping with Birmingham Broker. Errors and Omissions Disclaimer: Our dealership is not responsible for voided factory warranties. Dealer is not responsible for any option listed in the ad. Please verify the options at the time of purchase. Ads are placed by decoding VIN numbers and some options may get automatically selected. No intention of misleading the customer. All Inventory listed is subject to prior sale. Brokered vehicles may in some rare cases be short-term unavailable. Each transaction will include a $479.00 Document Fee plus any applicable in-state tax and title fee. We do trade-Ins provide financing and offer extended vehicle warranties on most vehicles. Ask dealer for details. Call us at (205) 716-1269 today to schedule a demonstration drive. Thank you for shopping with Birmingham Broker. Message: Thought you might be interested in this 1987 BMW 3-Series.